Designed for C2/C3 Equipment. All-around cleaner and deodorizer. Citrus Fragrance. Brightens and maintains grout. Use daily as a stand-alone product. 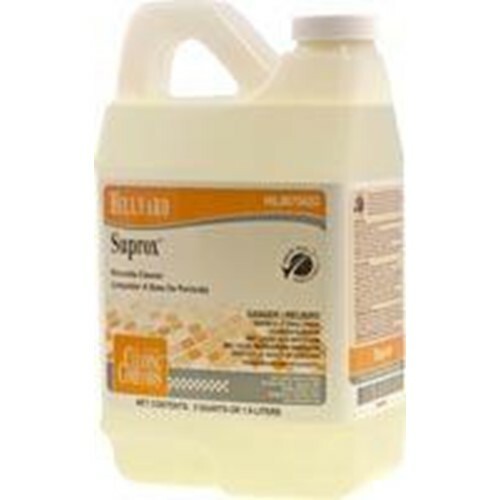 When a disinfectant- cleaner is used daily, Suprox can be used weekly to deep clean and assist with grout maintenance. Hillyard C2 refills have been specifically designed to perform in the C2 Cleaning Companion. Each refill contains a valve that matches the requirements of the C2, battery-powered pump system, insuring accurate dilution rate and high performance. Dilution rate is 5oz per gallon. Unit of measure is C2- C3 6 - .5 Gallons. Eight percent concentrate hydrogen peroxide base. All C2 refills come back in convenient .5 gallon containers. Green Seal Certified.